A cow’s natural diet is grass. Conventional beef production starts with cattle eating grass because they need it’s nutrients in the first year of development to healthily reach adulthood. 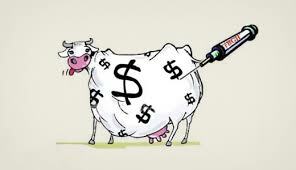 After 12 months they are switched to feedlots or CAFOs (concentrated animal feeding operations) where they are fed grains like corn and soy and distiller grains - a byproduct of ethanol production. Some are even fed animal byproducts like bone and blood. Cows are herbivores. They're natural diet does not include animal parts. As a result of their poor food quality, their meat is low in many essential nutrients. Routine use of growth hormones to speed up growth. The combination of grain-feeding and growth hormone administration often causes cattle to grow to an unnatural weight and size. Unnaturally large cows who get little to no exercise in confinement are unhealthy fatter cows. Keep in mind that fat is where toxins are stored in any animal. The use of antibiotics to prevent the spread of disease in poor feedlot conditions. In case you don't know (because I didn't for quite some time) the use of/exposure to antibiotics should be closely monitored and avoided as much as possible. Antibiotics are not a joke. They should only be used when absolutely necessary in humans. They kill ALL bacteria, including the essential beneficial bacteria we need for proper function in our bodies. 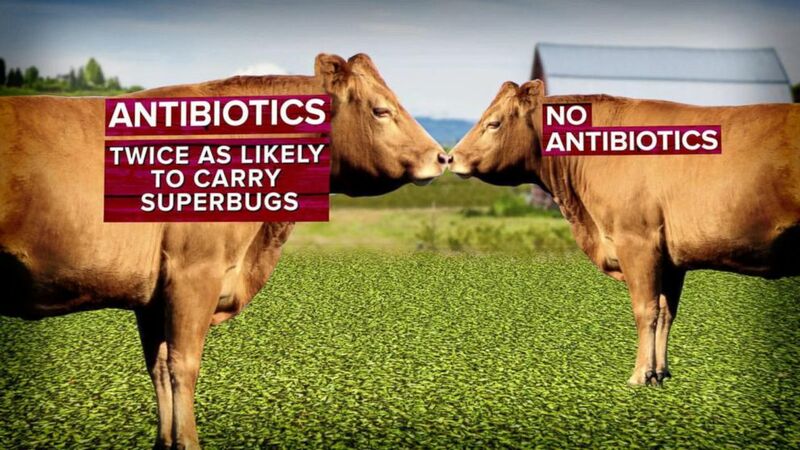 Aside from the unnecessary traces of antibiotics in our meat, the overuse of antibiotics in cattle is giving way to many antibiotic resistant bacteria leading to the creation of superbugs that cannot be effectively treated with antibiotics to prevent infections in humans. This is a big problem! As far as I know, there is no ONE, universally accepted definition for Beef Production Sustainability. There are no standards, regulations, or existing way to trace production practices used to make a claim like "Sustainable." Keep that in mind. MY personal, common-sense definition would include beef that is raised in a way that addresses the primary sustainability issues by farmers who are committed to the best practices for efficiently producing the most nutritious beef while minimizing the environmental impact. Farmers committed to sustainability care about soil and land quality, biodiversity, water usage, nutritional value security, impact on protected wildlife, deforestation, land use and management, social & community responsibility, and financial viability in their production practices. Here are some great resources to read up on, if you're interested. Without getting too graphic (because there are plenty of films that do this visually if you're interested) I'll briefly touch on the treatment of cattle. The stress experienced from these practices can not only be considered inhumane but also affect the health of the animals and their beef quality as a result. If this is important to you, you should take measures to source beef that has been humanely raised, treated, and slaughtered. Cattle that are allowed free range to graze on pasture and 100% grass-fed throughout their entire lifetime are without a doubt the healthiest. When allowed to live under their natural conditions they get plenty of sunlight and exercise and therefore their meat has less fat, and is higher in essential nutrients such as 3x the omega-3, more B-vitamins, CLA, Vitamin E, magnesium, potassium, and calcium compared to conventional meat. They may also have less Omega 6s which are highly inflammatory for us. Grass-Finished pasture raised cattle are never given growth hormones or antibiotics. They are allowed to grow naturally and there is no need for antibiotics if they are properly raised to live on pasture and allowed to free feed their natural grass diet. 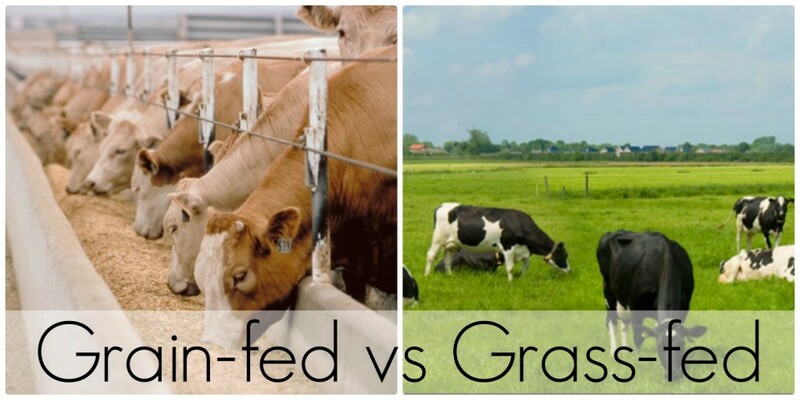 Grass-fed cattle are healthier and less likely to pass on disease and antibiotic resistant bacteria to you. When it comes to sustainability, although some would argue the opposite, I truly believe grass-fed grass-finished beef is the most sustainable option. 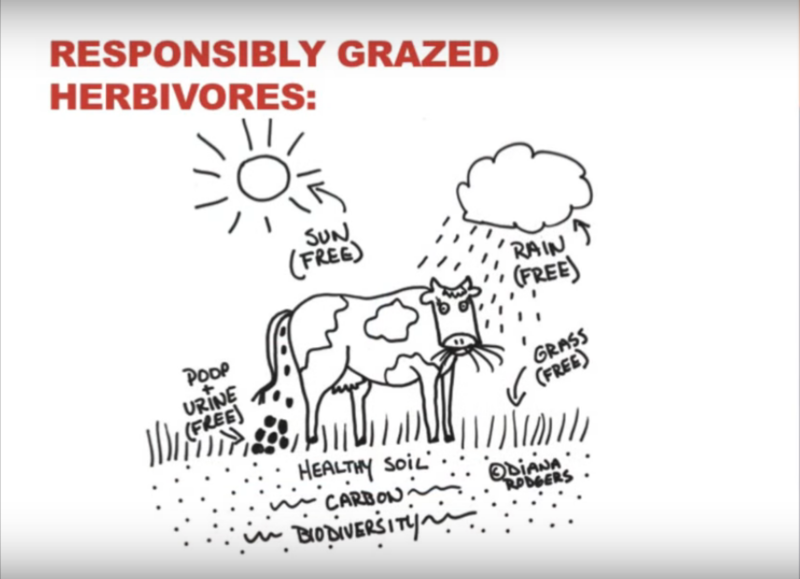 Although more land is used in 100% grass fed operations, keep in mind that a large portion of the earth's surface is meant to be grassland and is not suitable for growing crops or much else, really. Raising domesticated grazing animals on these grasslands plays an important ecological function that was once played by the wild ruminant animals we no longer have. The common argument is that ruminant digestion produces too much methane (from burps & farts) and it's effects on climate change is reason for concern. A less common, less sensationalized, more practical argument is that raising MORE cattle in grasslands is one strategy that can actually REDUCE THE CARBON FOOTPRINT (and potentially REVERSE climate change) considering carbon sequestration and the restoration of methane oxidizing bacteria (a relatively unexplored group of microorganisms that consume methane and convert it to organic carbon) in the grassland soil. Farmers are well aware from soil tests that a good organic carbon measure is a sign of healthy soil. We have the ability to sequester a lot of that carbon in the soil (out of the atmosphere) while adding to the food supply. Win/Win? I think so. There is good reason to believe far more herbivores existed then than we raise now. A system in which cattle are responsibly managed and rotated on pasture in a way that is similar to the way wild herbivores naturally lived works very well. Suggested Article: RUMINANTS – A methane pest or climate change solution? Often the amount of water resources used for raising cattle is over reported or misrepresented in a way to paint beef production as too water consumptive. These types of claims make the argument that conventionally raised, feedlot confined grain-fed beef is better (for the environment) than pasture raised grass-fed beef because less water is needed to grow grains than is needed for grass. This is another example of the problematic & common misuse and cherry picking of data, and omission of relevant facts to fit a narrative. These types of reports fail to mention that between 95-98% of the water used for grass-finished beef is "green-water" or RAINFALL. You know, that free water that would fall from the sky regardless of what is being grown or raised on the land? Also, it may be fair to mention again, that land used to raise cattle is typically not suitable to grow crops such as grains because it's intended to be grassland. This study estimates “typical” (conventional) beef requires approximately 410 gallons of water per pound to produce. A pound of rice also requires about the same 410 gallons to produce. Sugar, avocados, and walnuts are similarly water consumptive. Thats about 3x less water than conventional beef and grass-fed beef production actually improves the quality of run-off water from well managed pastures. These factors, among many others, makes grass-finished beef a much more environmentally sustainable option, in my opinion. This is the best place to start although you should be aware of some tricky "label" usage some companies are now using. (Image above is a funny example) I plan to make a post about this soon. USDA Definition: “Minimally processed – no artificial ingredients”. In my opinion, this is not enough. It's confusing and misleading. This definition only refers to the processing of finished goods (the meat you purchase at the grocery store or restaurant). It does not address sustainable agriculture practices or how the animals are raised. 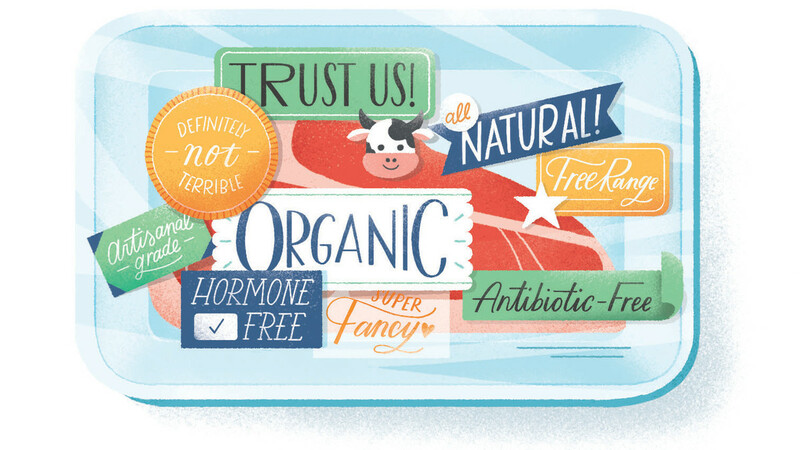 USDA “natural” labeling allows the use of antibiotics and artificial hormones — as long as use is discontinued before creating the finished product to prevent traces of the drugs from appearing in the meat. If you care about the humane treatment of animals, look for one of the certifying bodies' for humane treatment labels. The most popular is the Certified Humane (http://certifiedhumane.org/) label. Learn more about their standards here. Note: just because meat is labelled "Organic" does NOT mean it was humanely raised and treated. 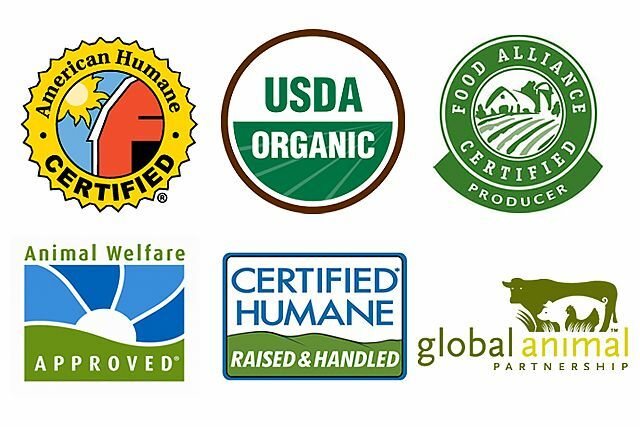 Also, just because meat does not feature a "Certified Humane" label does not mean it was NOT raised and treated humanely. It's possible it wasn't, but it's also possible the farmers are very humane in their raising and handling of animals but perhaps chose not to pay for the very expensive certification process required for using the label. Some small family farms are not able to afford the high fees associated with holding these certifications. Your best bet is buy meat with the the label or call the farmers to ask about their animal handling practices. 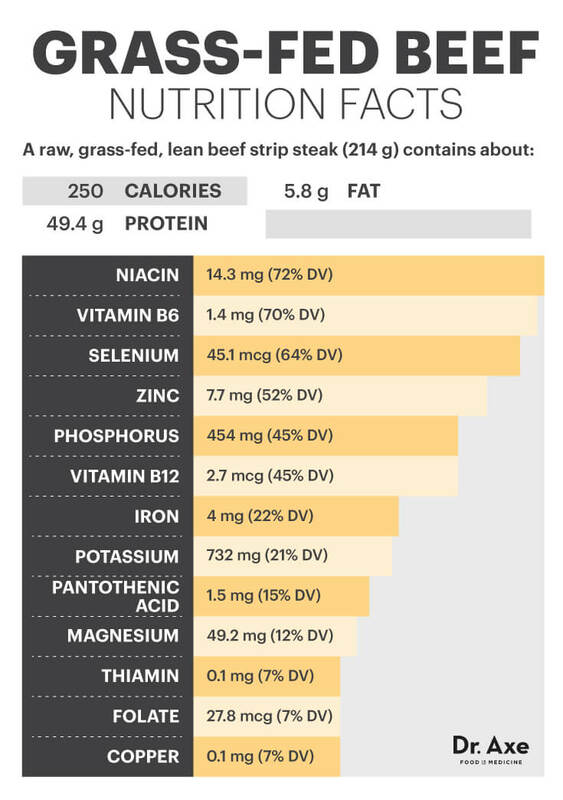 As I mentioned above, it's been proven that grass finished beef is more nutrient dense and healthier overall than conventionally raised beef. Again, grass-fed & finished beef is my suggestion to look for if nutritional value is a priority to you. Also mentioned above, there is no governing body, certification, or way to trace sustainable beef producers that I'm aware of because there is no one solid definition for "sustainability" as it pertains to beef production. My suggestion, if you care about sustainability, is to choose grass-fed beef. If you're willing to go the extra mile, do your research on the farms you're buying meat from. Those who are operating "sustainably" are very proud of that and they highlight their efforts anywhere possible. Track down the farm's website, read local articles about the farm to gain perspective on their community involvement and impact. Or call them to ask about their farming practices now that you know more about this. Note: Just because meat is labeled "USDA Organic" or "Certified Humane" does not ensure farming practices are "Sustainable". Again, it doesn't mean the meat wasn't farmed sustainably, but remember there is no "sustainable" label. You must do some research on the meat you buy if this is important to you. For example: Check out how this farm is addressing sustainability on their website. They care and showcase it proudly on their site. On this page they clearly define sustainability in their terms and outline which sustainable practices they implement. Or do what I do! I outsource my beef sourcing to a reputable third party. I order my beef from an AMAZING company that has a relationship with some great small family farms. They source the beef and distribute it to people like me who care about these issues and don't readily have access to this quality locally or the time to research each cut of meat bought at a grocery store. I highly recommend doing this if you consume beef regularly and want to be more responsible about it. They also offer chicken & pork! Thanks for listening/reading. This topic is very important to me and I hope it was helpful for you. Love you all!